Chicago Union Station has long been a focus of the Midwest High-Speed Rail Association. Thanks in part to our efforts—and the support of our members!—we’re beginning to see progress toward renovating and expanding our historic station. 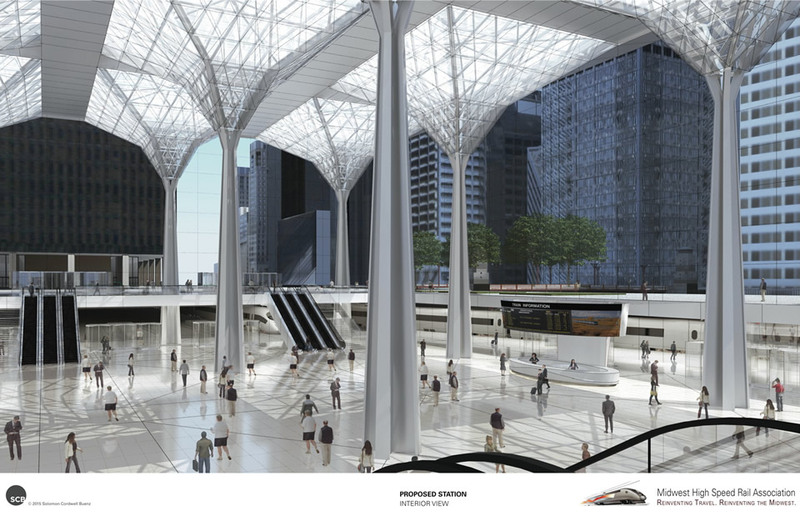 The Union Station Master Plan identifies a number of immediate ways of increasing the station’s capacity. Amtrak is already working on these near-term improvements. The plan also suggests a longer-term vision for dramatic new additions to the station, and it’s these big, bold ideas that we must focus on now. Amtrak owns the station and several adjacent parcels, and plans on exploiting real estate development to create revenue. Past development over the station is partly to blame for the station’s cramped nature today. We must ensure that the bold plan for Union Station’s future is driven by its role as the heart of the region’s transportation system, instead of becoming another new high-rise that happens to have a train station in its basement. Our vision for a Midwest high-speed rail network means more trains and more passengers at Chicago Union Station. Let your elected officials know they must support Chicago Union Station! 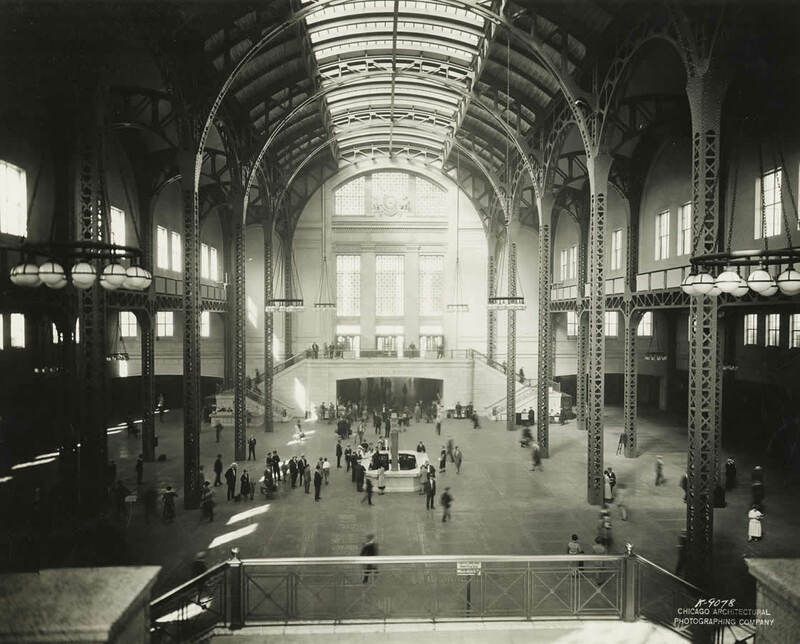 Union Station's original concourse, now demolished, was a beautiful and functional place to reach trains. Union Station was built to be a dramatic statement. Chicago was the center of the nation’s railroad system, and Union Station was a monument to that status. This statement was erased in the 1960’s as train travel declined and the station’s soaring, spacious concourse was torn down and buried under an office building. As the station reclaims its importance in the region’s transportation system, it needs an equally important architectural statement. The design of the station, both its appearance and its function, must be fitting of a station used by more than a hundred thousand people every day. 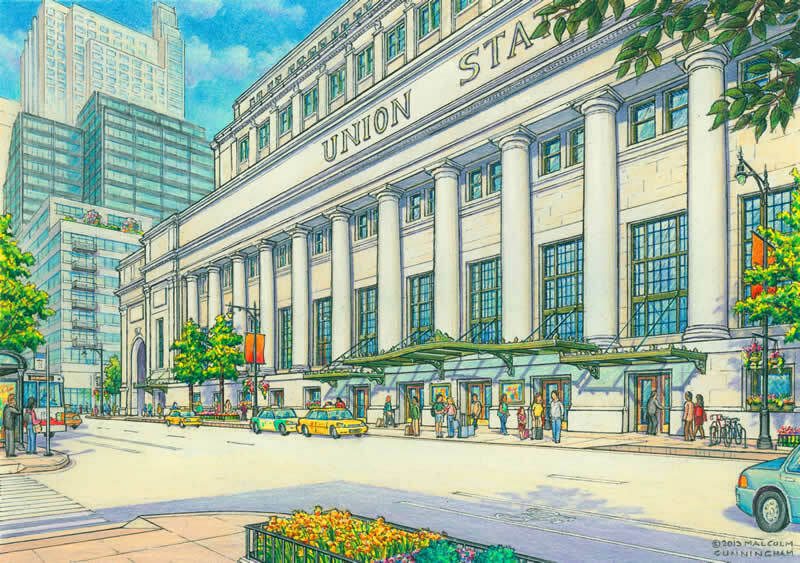 Redevelopment of Union Station should recapture the station's original grandeur and ease of use. In the long term, Union Station will require more capacity for trains than can be squeezed into the station’s current footprint. The Master Plan calls for expanding the station to the west, under Clinton Street. This new, multi-level tunnel could accommodate high-speed trains, commuter trains, or local transit trains. Any redevelopment or new development above and around the station must preserve and enhance the light and space available to the entire station footprint, including the planned expansion under Clinton Street. It should also create new vertical access points into and out of the station. 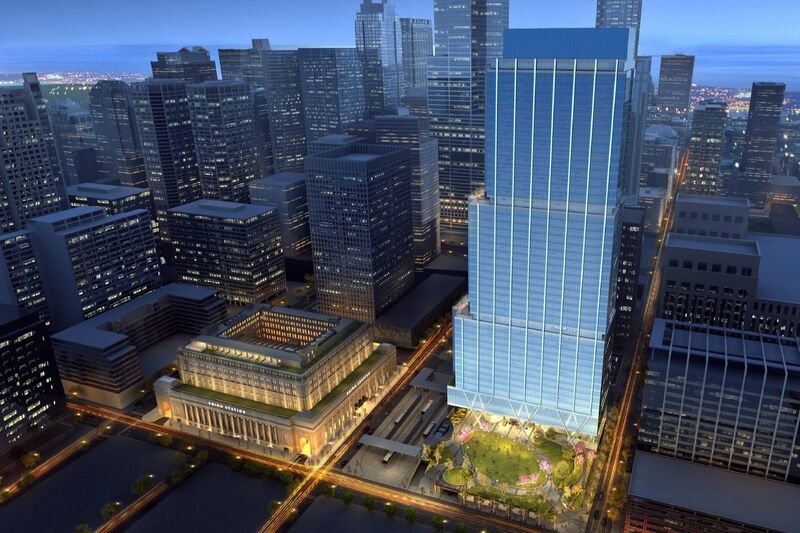 We must make bold plans for Union Station’s future as the heart of the Chicago region’s transportation system. All spaces currently available to passengers without additional purchase or charge shall remain so. The Great Hall shall remain the main waiting room. Dedicating limited space to a café with seating available only to café patrons and other retail is not an acceptable use of the Great Hall. Likewise, regularly using the Great Hall as a venue for private events is not an acceptable use of the space. The concourse shall be reconfigured to remove obstructions and create clear sight-lines. Passengers shall be able to easily identify the location of their departure gate and move freely to it. This includes making it possible for connecting passengers to view their departure gate from their arrival gate. New pillars and other support structures shall not impinge upon existing tracks, platforms and public spaces nor shall they impinge upon tracks, platforms and public spaces conceived in the Master Plan. All changes to canopies and other structures will ensure that tracks can be electrified with overhead catenary in the future. A new entrance on the west side of the station at Clinton Street would be part of creating a continuous east-west flow through the station. Amtrak has already begun improving flow through Chicago Union Station by moving certain passenger-related functions out of the cramped concourse and into the spacious Great Hall. The station Master Plan identifies a number of additional ways to improve the flow of people, and Amtrak is working on designs to implement these ideas. Reconfiguring the platform layout would create larger platforms and allow for some trains to pass through the station. The Master Plan suggests removing some of the mothballed baggage platforms, opening up space to widen the commuter train platforms. This will improve comfort and safety for the thousands of commuters that arrive and depart on Metra trains. Union Station desperately needs platforms that allow trains to pass through. The station’s current stub-end design means all trains terminate there. Through platforms would let trains from the south continue north, and vice-versa. The Master Plan calls for converting mail platforms under the old post office building, just south of the station along the river, into passenger platforms. These platforms are connected to the only tracks that pass through the station, next to the Chicago River. 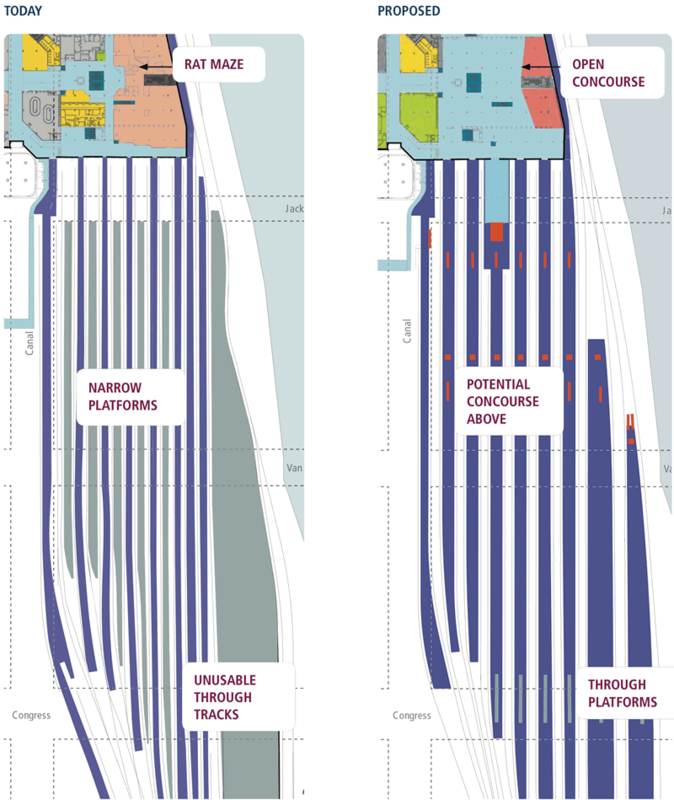 Our vision for a Midwest high-speed rail network means more trains and more passengers at Chicago Union Station. Following through on plans to improve and expand the station will require state and federal support. We've made it easy to send a message to your elected officials: support Chicago Union Station!